Healthy Alternatives Plus Liver Support System is a flavonoid-rich complex designed specifically for detoxifying the liver and gall bladder and supporting their functions. Recommended for those who are overweight, consume alcohol or tobacco, are exposed to environmental toxins, or either are or have been using medications or drugs. The artichoke bud sarsaparilla extract is an entirely unique complex of phytochemicals extracted from the bud of a hybrid artichoke plant (Cynara floridanum) and the root of the sarsaparilla plant (Smilax officinalis). The Liver Creates: Proteins, including blood “clotting factors”, bile acids- important for fat digestion, and cholesterol. 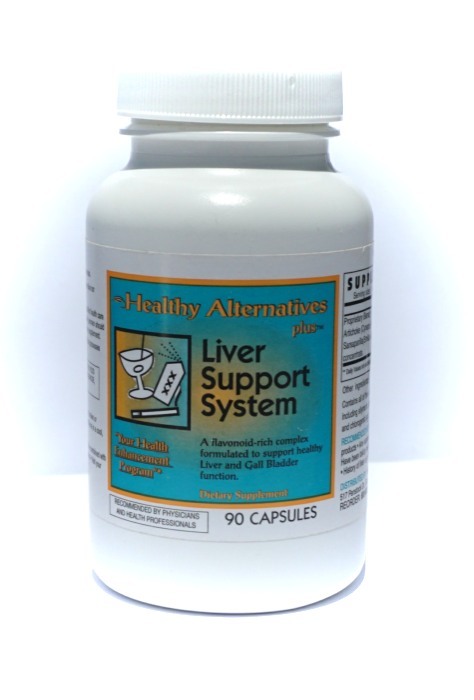 The Liver Filters or Eliminates: Poisons & bacteria from the digestive tract. Environmental poisons, pesticides, insecticides, heavy metals, alcohol, human-made and naturally occurring chemicals and toxins, bacteria, viruses, drugs, paints, fumes, smokes. The Gall Bladder: Acts as a reservoir for a substance called bile. Bile is produced by the liver to help your body digest fatty foods, and is stored in the gall bladder. This artichoke bud sarsaparilla extract has been used to normalize liver and gall bladder function in clinical settings for over 20 years. Artichoke bud sarsaparilla extract is well tolerated and completely safe with no known side effects. Contraindications include allergies to artichoke or sarsaparilla and biliary duct obstruction, such as with gallstones. Artichoke bud / sarsaparilla extract functions as a gentle detoxifier; digestive aid; and a liver, gall bladder, and bowel normalizer. Many of the most common symptoms of headaches, mental confusion, muscle pain, fatigue, poor coordination, nerve problems, skin irritations, and emotional imbalances can be a result of over exposure to toxins. Our bodies have become the final resting place of many dangerous poisons found throughout our environment. Even those who lead a relatively environmentally clean existence can become overwhelmed with internal toxins produced as a result of emotional traumas and microorganisms. However, in spite of the fact that our bodies are being deluged each day with external and internal toxins, we can still experience relatively good health if we make the efforts to clean up our internal environment.